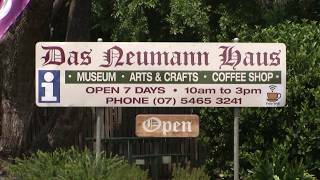 Das Neumann Haus, hand built by German immigrant Hermann Neumann in 1893, is located in Laidley, a town that retains a nostaligc feel. The house has been restored to its former condition, refurnished in the style of the 1930s and opened to the public as a house museum. Once considered the cultural hub of the community, now volunteers enthusiastically tell the stories of the Neumann family and the history of Laidley. Relax on the deck or under the shade of the 100 year old Jacaranda tree in the park whilst you sample delicious cakes, smoothies and more from Annie's Place Coffee Shop. Free wifi is available. Special events include the Heritage Festival, held annually in April and the Laidley Spring Festival, held annually in September.